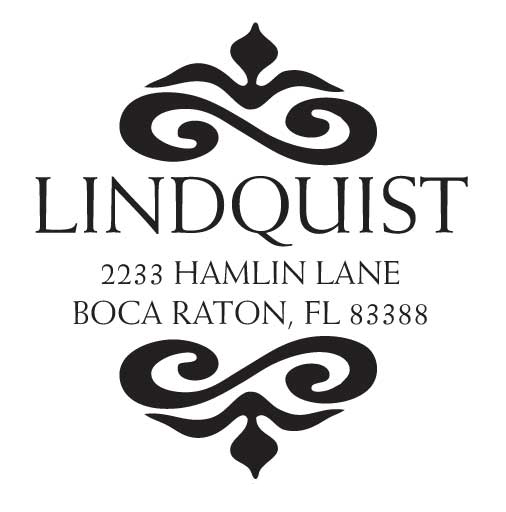 Designer Address Stamp with regal swirls. To order, enter name and address in the appropriate text LINE boxes below, chose the ink color desired, and then click ADD TO CART. Most orders that do not require a preproduction proof ship within 24-48 HOURS of receipt (weekends & holidays excluded). This product does not currently allow an online preview. If time permits, you may request the preproduction proof option below to eliminate any question on the final layout. Proofs typically add a day or more to total production time. Depending on the time of day, you should receive an emailed proof within 24-36 hours of submitting a completed order, excluding weekends and holidays. RUSH ORDER OPTION - If Rush Service is selected below, we will expedite both the preproduction proof (if required) and product production. Please allow for shipping time, and then indicate a MUST HAVE BY date in the Special Instructions box. To order MULTIPLES of this same stamp with IDENTICAL text and color, change the Order Qty in the box below. To order MULTIPLES of this same stamp with DIFFERENT text or color, ADD TO CART 1 at a time. Selecting the KEEP SHOPPING button from the cart will bring you back to the Designer Stamps category page. Select the CS-50070 icon, enter a new name, address, color, etc., then ADD TO CART. Volume discount pricing is calculated AFTER items are added to the shopping cart.